Effective treatment for homes, apartments and hotels. Custom, cost-effective solutions for businesses. Learn more about our Milwaukee pest control for residential and commercial properties. Call Ehlers Pest Management today! Ehlers Pest Management is a veteran-owned, family operated pest control company based in Racine County. Our service area includes all of the greater Milwaukee area, as well as Racine and Kenosha. Unlike the big pest control franchises, we have a local team of experienced pest control pros who take the time to locate the source of your pest problem instead of just spraying everything in sight. Wherever possible, we use environmentally responsible, pet-friendly products to keep your family and pets safe. Combining our own 4-step approach with Integrated Pest Management (IPM), we solve the most challenging infestations of bed bugs, ants, stinging insects and rodents. We’re so confident we’ll solve your pest problem, we offer the best guarantee in town: If you’re not completely satisfied with the work we do for you, we’ll keep working at no charge or refund the cost of your last extermination service. 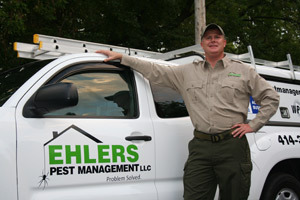 Ehlers has adopted the use of IPM approaches in all the Milwaukee area pest control services we offer. The professional exterminators at Ehlers Pest Management employ an environmentally-responsible method of commercial and residential extermination methods for our clients throughout southeast Wisconsin. We deal with a wide variety of infestations in homes and office buildings on a regular basis, and we’re here to provide you with the help you need. No matter if you’re dealing with a rodent infestation in your office or a wasp nest in your yard, the professional exterminators at Ehlers Pest Management can handle the job. Call us today to get a free quote! You’ll have your sanity and your peace-of-mind restored when you hire our Milwaukee exterminators. And with our 100% Satisfaction or Your Money Back guarantee, you have nothing to lose (except the bugs, of course). 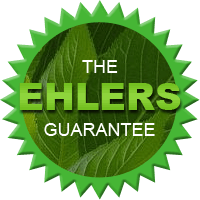 Ehlers Pest Management is the only Milwaukee pest management company to integrate Green approaches with Integrated Pest Management (IPM) by employing our exclusive Ehlers approach. Our environmentally-responsible Milwaukee pest control company ensures successful pest elimination while focusing on safeguarding the health of humans, pets and the environment. Ehlers combines sound science and innovative technologies with IPM to provide you with timely, affordable local pest control solutions which minimize adverse environmental effects. Wherever possible, our exterminators use pet-friendly approaches to eliminating pests. Our Milwaukee Exterminators are Here to Help! Ehlers Pest may be based in Milwaukee, but we know bed bugs are everywhere and we do whatever we can to get to wherever there's a bed bug problem, within reason. If you live in the Racine or Kenosha area, for instance, and have discovered you're now sharing a bed with hundreds of tiny blood-sucking bed bugs, get in touch with us...today! 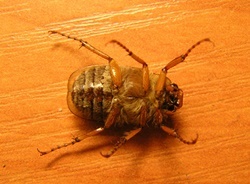 A bed bug infestation is seriously big trouble if left untreated. What starts out as 5 bed bugs becomes 500 in very short order. Sleeping in the tub is no solution. They'll find you wherever you try to seek refuge. Our experienced bed bug exterminators use proven methods to get rid of bed bugs--from the north shore Milwaukee neighborhoods of Fox Point and River Hills to the southern reaches of Racine and Kenosha. Green / Organic Pest Control Services-- Pet-friendly! Something Bugging You? Get Pest Control Services for Your Milwaukee, Kenosha or Racine Property Today! Contact Ehler's Pest Management to schedule an inspection.